John Daly received seven exemptions last year but complained when he was turned down for spots at the Bob Hope Classic and Waste Management Phoenix Open. It’ll be interesting to see how many free spots he gets in 2012 — in other words, has he finally worn out his welcome? He had a televised meltdown at a tournament in Austria, then withdrew from the Australian Open after hitting seven shots into a lake on the 11th hole and running out of golf balls. (Daly was seven over par before the disaster.) Many observers thought Daly’s conduct was not only unprofessional but premeditated because he was angry after drawing a two-shot penalty for playing the wrong ball — a range ball — from a fairway bunker on the 10th hole. 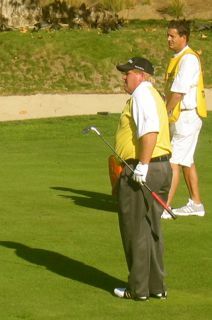 Australian golf officials were upset enough to rescind Daly’s invitation for the subsequent Australian PGA Championship. (Daly has a long history of withdrawing from tournaments before, during and after rounds.) Last year, Daly received exemptions from the Farmer’s Insurance Classic, Mayakoba Classic, Transitions Championship, Zurich Classic, Colonial Invitational, Travelers Championship and Canadian Open. Though he hasn’t been exempt for years, Daly has not attempted to regain his card by going back to Q-school. Bud Cauley gave up his final year of eligibility at the University of Alabama to turn pro and apparently knew he was ready. Cauley parlayed four exemptions into a PGA Tour card. He’s exactly the kind of player sponsor’s exemption should go to — promising young talent that needs a chance. Cauley received an exemption from the Viking Classic in July, where he finished fourth. He was in contention at the Frys.com Classic, where he placed fifth and won $340,000. Those top-10 finishes got him into tour events the following weeks. He was able to bypass Q-school by having more winnings on the non-members’ money list than the player who finished 125th on the official money list. Cauley won $735,150 in eight starts. Sam Saunders proved for a second straight year that it’s good to have a famous relative. He’s the grandson of Arnold Palmer and was able land his maximum of seven exemptions for a second straight year since dropping out of Clemson University. Saunders also scored some Nationwide Tour exemptions. Saunders finished 15th at Pebble Beach, where his grandfather is a part-owner, and 30th at Bay Hill, the tournament his grandfather hosts. Kevin Tway, son of former PGA champion Bob, scored four exemptions and missed four cuts. Patrick Cantlay came off a remarkable freshman season at UCLA and enjoyed an even better summer. He was low amateur at the U.S. Open and runner-up at the U.S. Amateur. His stellar play prompted four sponsor’s exemptions, and Cantlay made the cut each time, finishing ninth at the Canadian Open. Had he been a pro, he would’ve won more than $380,000 in his PGA Tour appearances, but Cantlay went back to UCLA to be a sophomore. Scott Stallings, a former star at Tennessee Tech, got into the Transitions Championship because his friend and mentor, Kenny Perry, helped him get an exemption. (Perry has an endorsement deal with Transitions, the eye care company.) Stallings contended for the title, finished third and used that good finish as a springboard to get in more tournaments during the summer. He won at Greenbrier and is fully exempt. Gary Woodland won that Transitions Championship. Like Stallings, he was a Q-school grad the previous year, but he finished third in Phoenix after Waste Management offered him an exemption. Woodland won more than $3.4 million last year, finished top 20 on the money list and paired with Matt Kuchar to win the World Cup. Brendan Steele was another young player who needed exemptions early in the year to get into tournaments. He got passes for Riviera and Bay Hill, then won the Valero Texas Open in May. Rory McIlroy, who won the U.S. Open in June, ironically needed an exemption to defend his title at the Wells Fargo Championship because he decided to drop his PGA Tour membership at the end of 2010. Cantlay, by the way, had the best record of making cuts among players who got exemptions, going 4 for 4. Scott Piercy and Lee Westwood (not a PGA Tour member), were 3 for 3. Thanks, Gary. Your next assignment is to rank the tournament courses you mentioned, three of which are already in the Top 50, in your order of preference.